Over the last one hundred years the five-pointed red star has become a well known symbol of communism and some strands of socialism around the globe. While its origins are disputed, the emblem likely dates back to the earliest days of the 1917-22 Russian Civil War when it was worn as a uniform badge by various Bolshevik-led units of the former imperial armed forces. These included the reserve battalion of the Semyonovsky Life-Guards Regiment, which played an important part in the February Revolution of 1917 (the grouping became the 3rd Petrograd City Guard Regiment of the Workers’ and Peasants’ Red Army in 1918 before joining the “White Russians” in 1919). While the colour red was associated with radical or labour movements in Europe since the mid-19th century, featuring prominently in the flags, scarves and armbands of the 1848 French Revolution, the origin of the five-pointed star itself is rather more difficult to discover. Claimed inspiration from the green star badge or Verda Stelo of the international Esperanto organisation in the late 1800s is almost certainly apocryphal. In a similar vein, suggestions that the five points of the device originally represented the five continents, various classes of society or stages of proletarian struggle seem largely fictitious. Ironically, a more likely association for the communist star is with the national flag of the United States of America, the Stars and Stripes. This was emulated in a number of political banners and logos in the 1800s, notably in the Stars and Bars of the Irish Republican Brotherhood in Ireland during the 1860s (though the stars on the Fenian flag were white with eight-points on a green background). Early Soviet artisans may well have found the US star a relatively familiar and stylistically balanced symbol to copy. And one initially lacking the hostility which crept into later American-Soviet relations. For much of the following 20th century the Bolshevik emblem was adopted by left-wing groups across Europe and the developing world, not all of which were friendly to the Russian-hegemony of the Union of Soviet Socialist Republics or USSR (for instance, the People’s Republic of China uses a yellow star on its official flag and symbols). In Ireland, the five-pointed socialist star makes it first appearance with the Republican Congress. Founded in 1934 by former, Marxist-leaning members of the Irish Republican Army and Sinn Féin, the organisation attempted to revive the Irish Citizen Army (ICA), a workers’ militia which had disappeared at the end of the 1922-23 Civil War. The principle banner of the ICA was the Star and the Plough flag or more familiarly, the Starry Plough (in Irish, Céachta agus na Réaltaí or An Camchéachta). It was formally designed by the Belfast artist William H. Megahy, who lectured at the Metropolitan School of Arts in Dublin, from a suggestion by an unknown individual, possibly the labour leader Jim Larkin (the argument that the poet and writer George William Russell, better known by the literary pseudonym Æ, was the inspiration seems a weak one). Produced by the Dun Emer Guild, a nationalist-orientated cooperative in Dublin which specialised in Celtic Renaissance crafts under the leadership of the English-born Evelyn Gleeson, the flag was made public in April 1914. It consisted of a representation of the constellation Ursa Major (also known as the Plough), displaying a stylised yellow plough with a sword for a coulter dotted with seven, eight-pointed silver stars, outlined in black, on a blue-green background. The original flag was lost after the Easter Rising of 1916, taken as a war trophy by the British Occupation Forces and not returned to Ireland until 1956, so there was some confusion in the 1930s over its exact design. In the end, after much acrimonious debate, the Republican Congress adopted a new Ursa Major banner consisting of seven white stars on a blue background, though production colours varied greatly from silver to grey and light to dark blue. Unsurprisingly given the left-wing nature of the body, the traditional eight-pointed stars were abandoned in favour of the new international symbol of socialism: the five-pointed star. For simplicity’s sake, and to significantly reduce production costs, the stylised plough was removed entirely, giving the symbol a superficial resemblance to the banner of the US state of Alaska, which was adopted in 1927. The ICA flag was soon taken up by the closely related Irish Transport and General Workers’ Union (now the Services, Industrial, Professional and Technical Union or SIPTU) and the Labour Party. In time it became an unambiguous symbol of socialism and socialist republicanism in Irish politics. It wasn’t until the 1970s that the former Soviet star was to find a further use in Ireland. This was with the emergence of the Irish National Liberation Army (INLA) in late 1974, a breakaway faction of the communist-infiltrated Official IRA. In 1975 the INLA unveiled a new logo, a large, red five-pointed star silhouetting a left hand clenching an AK47-style assault rifle in black. 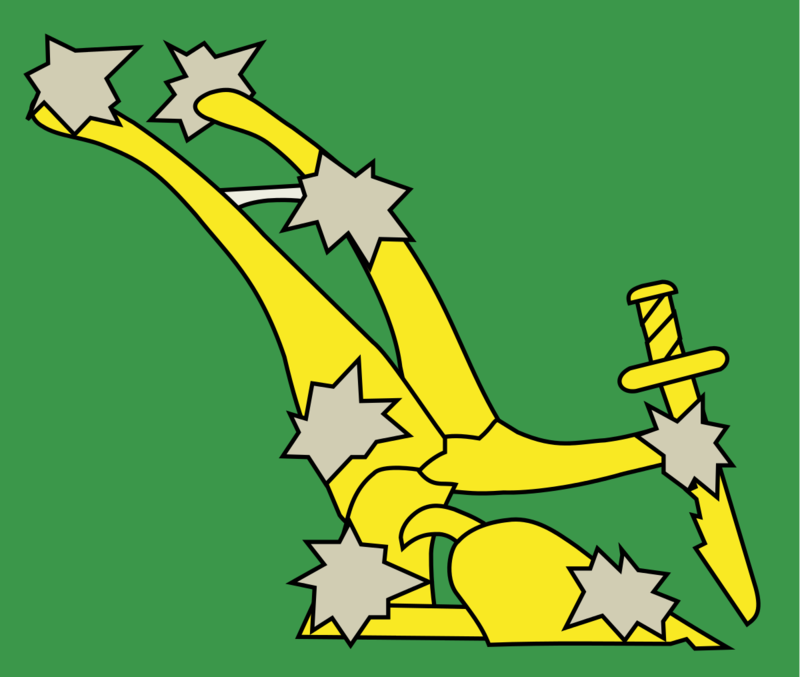 Sometimes this was combined with the Starry Plough and Irish national flags, the former angled to the left, the latter to the right, both behind the star and gun motif. Eventually this became a general device of the Irish Republican Socialist Movement, representing the INLA and its political wing, the Irish Republican Socialist Party (IRSP). However the latter party usually displayed the Starry Plough on its own in its publications for electoral and legal reasons, though most people were aware of its broader military links. This representation usually featured white stars on a red background, though sometimes the 1930s’ blue field was made use of. In the early 1980s the Starry Plough gained renewed prominence with the hunger strikes by Irish Republican prisoners-of-war in the Long Kesh camp outside Belfast (the notorious H-Blocks, named after the distinctive architectural design of the buildings housing the inmates). From May to June 1981 three INLA volunteers died while seeking the restoration of political status by the British authorities. These were Patsy O’Hara, Kevin Lynch and Michael Devine, their funerals drawing crowds numbering in the tens of thousands. Partly in reaction to the renewed association of the plough symbol with republicanism, in 1991 the Labour Party abandoned the Starry Plough as its symbol in favour of the Red Rose, an emblem of Continental-style social-democracy. Though revived for use during the 1916-2016 commemorations of the Easter Rising the plough remains a rare occurrence at the party’s events. 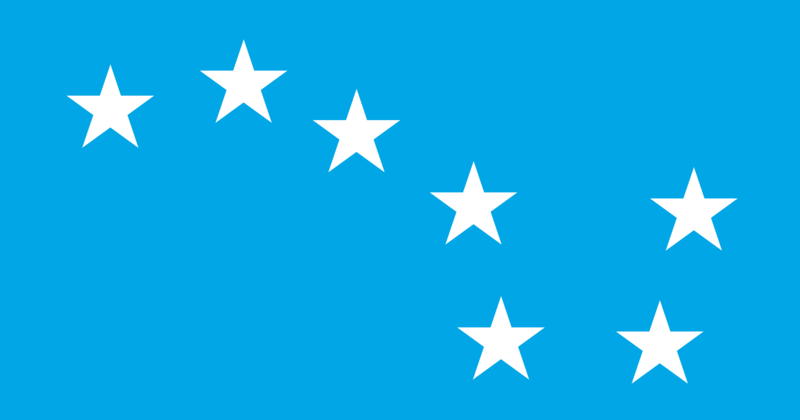 By the middle of 2006 a variant of the star had appeared with the establishment of éirígí, a left-wing republican organisation that became a registered political party in 2010. The group’s main logo, a stenciled affair, consisted of a five-pointed green star on a white background with the group’s name below in orange, these three colours matching those of the Irish national flag. A recent variant has the words “Liberty, Equality, Community” in a three-quarter-circle around the main logo (though not, perhaps tellingly, in the Irish language). Another version of the symbol, and more conventionally socialist in nature, features a yellow logo on a red background. Interestingly this grouping has also made great use of the original 1914 Starry Plough flag at its demonstrations and marches over the last few years, explicitly claiming ownership to the socialist strand of the Easter Rising of 1916. In 2007 a republican lobby group was created by former members of Sinn Féin, initially styling itself, Ex-POWs and Concerned Republicans against RUC/PSNI & MI5 (a rather verbose title which inevitably drew much comment). This was later renamed as the Republican Network for Unity or RNU, registering as a political party in 2013. Initially the organisation’s chief symbol was a green, white and orange variant of the modern interpretation of the Gal Gréine or Fenian Sunburst flag (this is normally orange on a blue background, and while most contemporary versions date to the 1980s its ultimate origins go back to literary descriptions of the late Medieval period). This was later joined by a tricolour version of the “Republican Phoenix” on a white or black background, taken from a stock image file. This logo was closely associated with the emergence of the “Provisional” Irish Republican Army in the turbulent period of 1969-1970, and before that with the secret 19th century Fenian movement (both the Irish Republican Brotherhood or IRB in Europe and the Fenian Brotherhood of America or FBA and its successors in the United States made use of phoenix-like symbols). Gradually the Phoenix design came to dominate in the party’s publications and banners, recently gaining the addition of a socialist, five-pointed red star, prominent between the outstretched wings of the phoenix. 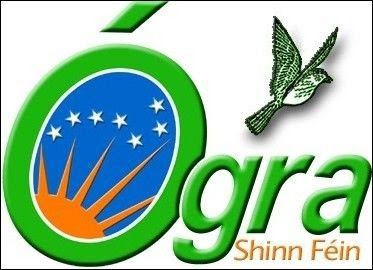 In 2012 Sinn Féin relaunched its Irish-named youth wing, Ógra Shinn Féin, as the bilingually-titled Sinn Féin Republican Youth or SFRY (another indicator of the significantly lower status of Ireland’s indigenous language among even nominally nationalist groupings or parties). 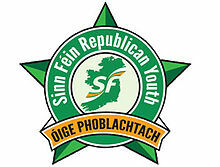 The organisation’s new logo featured a large, five-pointed, variegated green star largely obscured behind the party’s main logo, and a circular band containing the English title (most representations also feature a nod to Irish, by having the words Óige Phoblachtach in a lower banner. Sometimes the placement is reversed). However in recent times SFRY has also appeared as Republican Youth with a poorly designed new logo featuring the grouping’s name in green beside a stock, very dove-like wren with the modern Starry Plough emblem underneath in red. In this symbol the Irish language has been discarded completely. 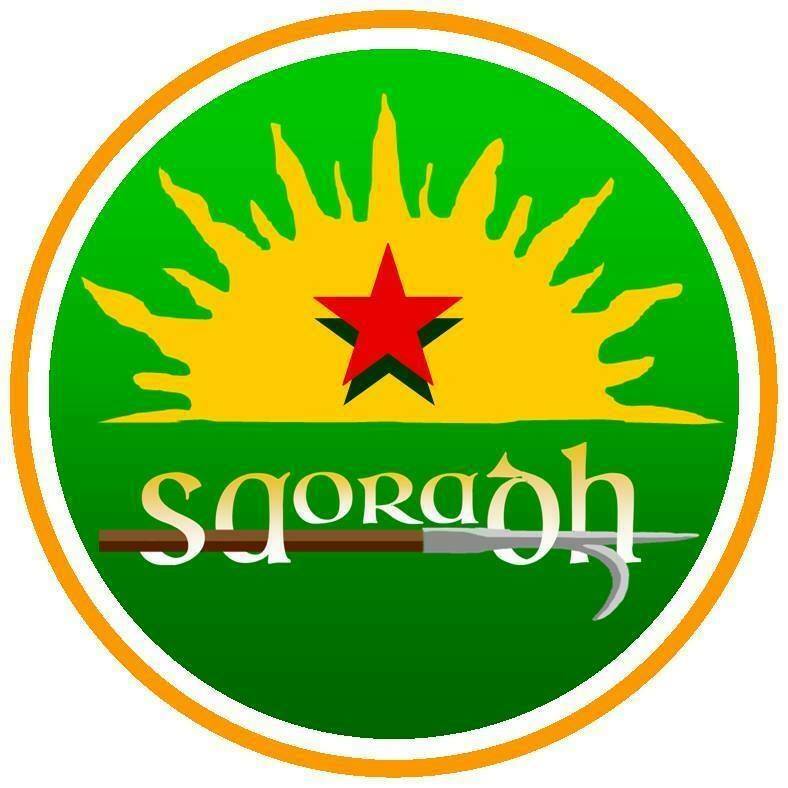 Finally, the autumn of 2016 saw the launch of Saoradh, a new political party drawn from a wide spectrum of Irish republican opinion. While decidedly traditionalist in tone, the group places itself on the political left, a position reflected in its main logo. This consists of a yellow Gal Gréine or Fenian Sunburst on a green field, with a five-pointed red-star in the middle and a 1798 Pike, an old nationalist symbl, underneath. 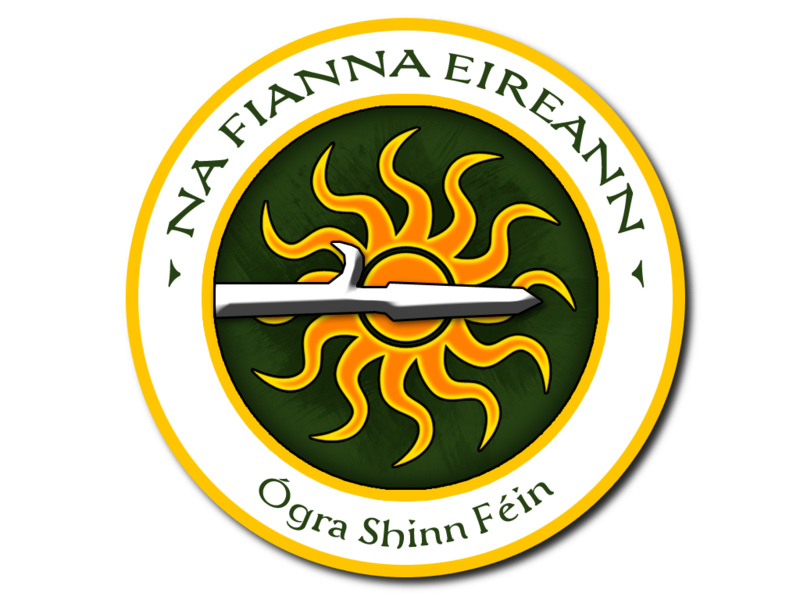 In many ways the motif resembles the badge of the original Fianna Éireann, a republican scouting organisation founded in 1909, which was updated for its centenary celebrations by Sinn Féin in 2009. As we can see from the above, while multi-rayed stars and suns have a long history in Irish nationalist and republican iconography, the five-pointed star is very much a mid-twentieth century feature with its origins in the then contemporary Soviet star, before becoming a lasting symbol of left-wing republicanism in Ireland. Unfortunately in most cases the authors of the various logos mentioned above are quite unknown, though their inspirations or artistic borrowings are often clear. Note: In native Irish literature and folklore the colours green, white (silver), red and yellow (gold) have enormous significance and feature prominently in the descriptions of clothing, armour and animals. You were on the right track with the Russian revolution but the star origin is older, it signifies “the workers hand” with 5 points for the digits. Which came, first, the symbol or the symbolism? 😉 It seems the former in the case of the Red Star. The later interpretations are probably post-adoption rationalisations. Good ones though! I think it all goes back to Chinese kanji 3000 years ago. Ironically, the Americans actually used a red five-pointed star to identify planes of their (Army) Air Force Signal Corps machines to ground troops participating in the hunt for Pancho Villa in 1916. Non-political and non-military use of the red five-pointed star was as a merchant symbol for excellence in quality dating back to before 1900. There are a variety of products still today that display it as such, the Italian S. Pellegrino spring water bottlers for example. Perhaps there was some nexus to that in making the choice of the symbol at the time. Yep, I think it was adopted in March-April 1916? Yes, the star was also a commercial symbol too, and was found in the 19th artistic movements. The origins are mysterious but I’m sure there is an historian out there who has some explanation of it. I just haven’t seen it in writing yet. Unfortunately. Yep, but that not a star symbol. Though an arresting one, all the same.